Serve guests faster (and more accurately). This waitress/waiter book is durable, spill resistant & loaded with must-haves. Includes a 3-in-1 wine corkscrew that's a foil cutter & bottle opener, too. Waitress Organizer for Maximum Efficiency Tired of fussing with cocktail napkins, scraps of paper or ordinary notepads? Take orders more quickly, stay organized and serve accurately with the Kubesa Waiter Kit. 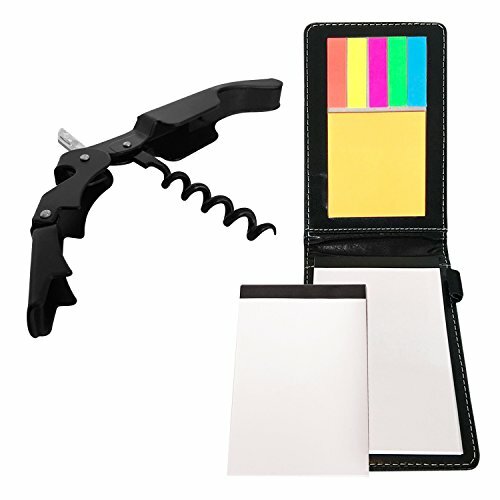 Your server book features: Two-tone, black-and-brown leather cover 2 writing pads (5.5 in x 3.5 in) 20 Sticky notes Color-coded page markers Pen strap holder Spill resistant with sophisticated style, it fits easily into your pocket or apron, so it goes wherever you do. Use the notepads for daily food specials, cocktail orders and more. Plus, the color-coded page markers are perfect for tracking steak temperatures & wine dates. Waiter's Corkscrew for Easy Opening On a busy night, you don't have time to fumble around with multiple barware tools. That's why your wine corkscrew features a convenient, all-in-one design. Similar products serve only one purpose, but ours combines a wine opener, foil cutter & bottle opener into one pocket-sized device. It features: Stainless steel, matte-black design Double-hinged fulcrum for extra leverage Teflon-coated worm for smoother pulling Serrated foil cutter Compact and lightweight, it can uncork wine, crack open a brew, even pop the top on a beer can in one convenient tool. Perfect for cocktail waitresses & food runners. Pick up one for yourself today. Also makes a great gift for any server. Own a restaurant or bar? Order in bulk for your entire staff. Every Sommelier Needs this All-in-One Corkscrew: Stainless steel and double hinged, foil cutter and smooth pull for fine dining tableside presentation. Increase Your Tips with Perfect Organization: Need to check inventory? Highlight food allergies? From interacting with chefs to serving customers, your waiter pad helps you do it all. Money-Back Guarantee: We know you'll appreciate the time-saving features of your new Professional Fine Dining waiter and sommelier kit. However, if you don't absolutely love it, return it for a full refund - no questions asked. If you have any questions about this product by Kubesa, contact us by completing and submitting the form below. If you are looking for a specif part number, please include it with your message.